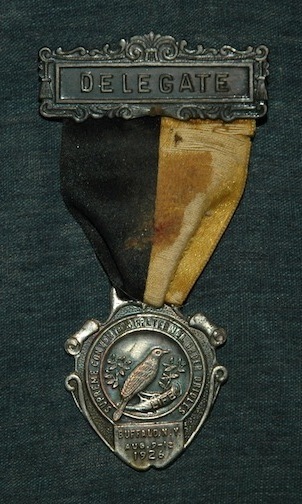 Fraternal Order Orioles (FOO) medal from the 18th Annual Supreme Nest Convention, held in 1929 in Boston. Upper portion is a generic name panel pin badge, with the name of the delegate still extant on a slip of paper within, “H.D. Brubaker”. 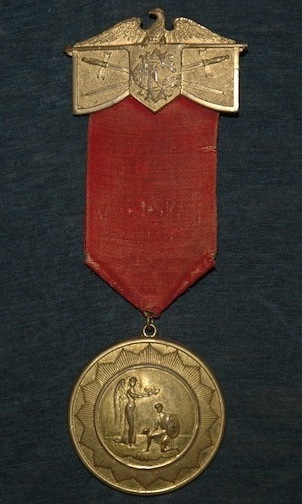 From this upper pin hangs a black and gold ribbon printed in silver with the word “DELEGATE” and with a lozenge-shaped emblem. Maker’s stamp on verso of medallion. 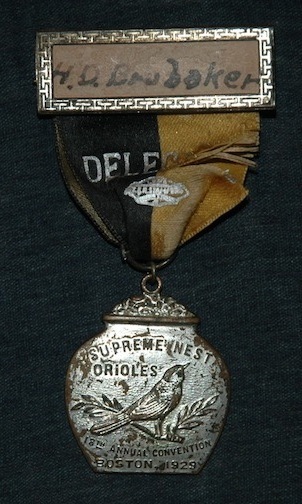 Fraternal Order Orioles (FOO) medal from the Supreme Convention held in Buffalo, NY, 1926. Ostensibly, this would be the 16th Annual Convention of the Supreme Nest, based on info from TAFC.2011.37, though those specific words are not found on the medal. Upper portion is a generic decorative panel with the word “DELEGATE”. From this panel hangs a black and gold ribbon with no apparent stamping or decoration. Knights of the Golden Eagle Past Presidents Medal. PP designation based on Phoenixmasonry listing of matchig piece. Upper, pin panel shows an eagle displayed with wings elevated, two swords in its talons. A seven pointed sun bursts from behind the panel. From this upper pin descends a broad purple ribbon, somewhat faded and with a ghost of the device that hangs over it, which consists of a sword pointed downward, crossed by two gavels or hammers with heads downward, with a crown over the crossing of all three. No maker’s mark is evident, although verso of upper panel can be seen a patent date of August 24, 88. A gift from Brother Seth Anthony. 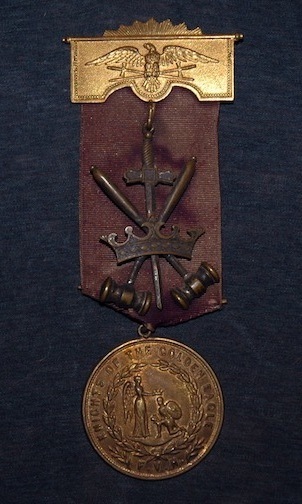 Knights of the Golden Eagle Medal. No date, no particular designation apparent. May be a general members medal. Upper, pin panel shows an eagle displayed with wings elevated, a shield in its talons bearing the monogram KGE, two swords crossed behind it. From this upper pin descends a broad red ribbon, lightly faded. The medallion is hollow and decorated in hammered relief, showing an angel placing a crown on the head of a kneeling knight, surrounded by a wreath, and this surrounded by sunburst. No legend or motto on this medallion. No maker’s mark or other info recto or verso. Elks badge from Lodge No. 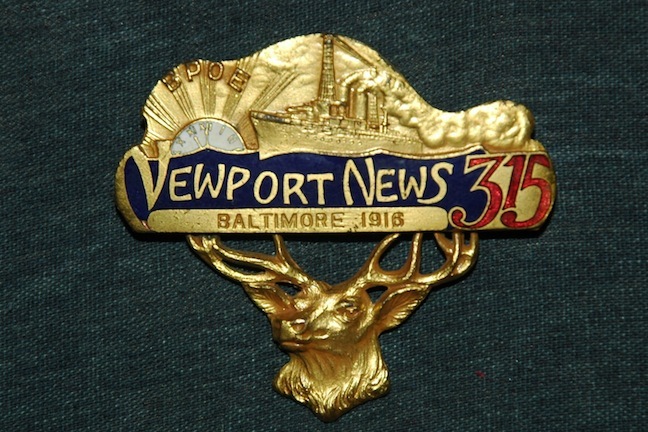 315, Newport News, VA, commemorating the 52nd Grand Lodge Reunion, held July 10-15, 1916 in Baltimore, Maryland. Each (or many) of the attending Lodges would have produced their own badge to wear to the event. Styled for Newport News, this gold tone plated pot metal badge shows a large ship under steam, heading into a rising or setting sun, the disk of which is a clock face showing 11pm, moving through waves rendered in dark blue enamel. Through the rays of the sun are the letters “BPOE”. Through the waves in waving, stylized letters is emblazoned “Newport News” and then “315” in red enamel. Below is a narrow panel reading “BALTIMORE, 1916”. The whole is carried upon the rack of an elk, rendered in partial relief, below.